This building, which was erected in 1907 by A Bause, a firm of building contractors, is an excellent example of German Colonial architecture[" at the beginning of the 20th century. The Deutsche Afrika Bank originated from the banking division of the Handelsgesellschaft ("Damara and Namaqua Trading Company"). A branch of the parent company in Hamburg, the Deutsche Afrika Bank was the first bank to be built in Lüderitz. The first plans of the building were submitted in 1906. It was erected and completed in 1907 by the building contractor A Bause. Like numerous other buildings in Lüderitz, this structure is a fine example of early 20th century German architecture. The model for the corner tower, for instance, can be found on a number of buildings erected in Windhoek and Swakopmund between 1900 and 1910. Likewise, the slightly jagged gable to the right side of the building is a variation of one commonly found in old houses in Germany. There are also some elements that deviate from the prevailing styles, however, for example, the shape of the window just below the corner tower is rather uncommon. A sliding window, through which the workers from the diamond fields in nearby Kolmanskop were paid, is a remnant from an era when Lüderitz experienced an economic boom after the discovery of the first diamonds on Namibian soil. The bank's strongroom is still the gigantic original item that served to hold customers' diamonds. In spite of the harsh weather conditions, the original wrought iron work in front of a number of windows on street level is still in good condition. After WWI, the Deutsche Afrika Bank was liquidated and taken over by the National Bank of South Africa Ltd in 1922, (zawp) and by Barclays Bank (Dominion, Colonial and Overseas) in 1926. After 1958, the owner of the building was Mr WF Lubowski, father of one of the heroes of the Namibian liberation struggle, Anton Lubowski. The Deutsche Afrika Bank Building is situated in Bismarck Street in Lüderitz. It is presently used by Nedbank. It is rated as an A Class building, with a score of 95 on the NIA Index. 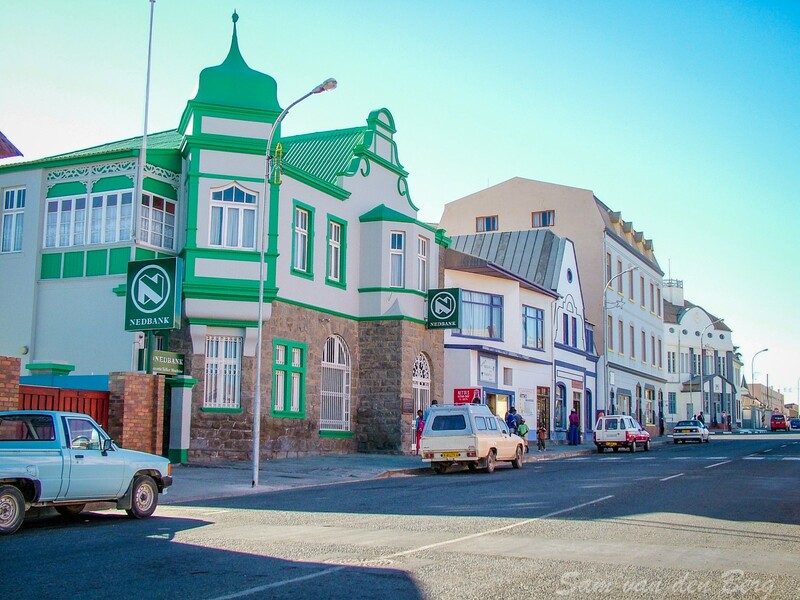 The Deutsche Afrika Bank Building in Lüderitz was officially proclaimed a national monument on 7 February 1980.